A leading provider of executive suites, Premier Business Centers, selects Think Marketing to relaunch its brand. 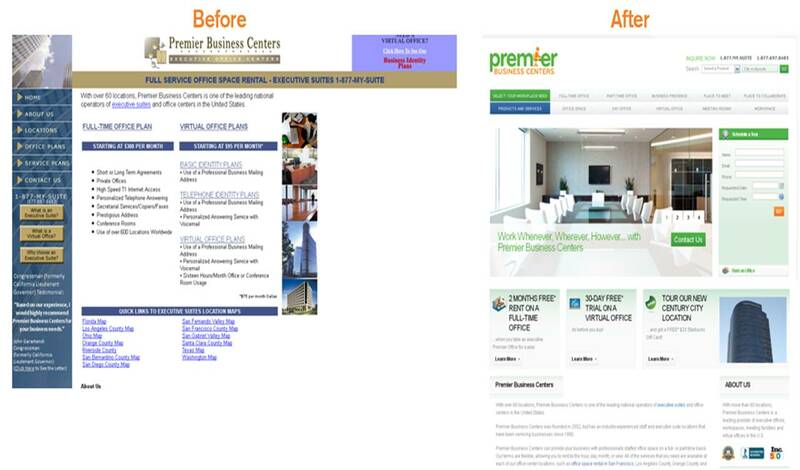 Wanting to update their brand image, Premier Business Centers (www.pbcenters.com) selected Think Marketing as their marketing partner for a brand identity refresh. Think was hired to work closely with Premier's senior management team to produce a new company vision, mission, logo, and tagline, and then deploy the new look and feel in a website redesign. The brand identity would drive Premier's business forward after hitting a 10 year milestone anniversary, and carry the company into a new phase. The strategic work was designed to more accurately reflect the position of the company today, inspire employees in their daily work, and better resonate with customer audiences. To begin, Think worked to develop new vision and mission statements that better embody who Premier is as a company. Think's work illustrated that arming Premier with a better brand platform would enable them to internally communicate how every team member delivers the "Premier Experience" through their daily actions and interactions with clients. The idea behind this approach was to enlist everyone in the company as a brand ambassador. 2) we believed this was a strong message for Premier as a service business. In fact, so much so, that when we developed both the logo and the tagline, we presented the word "premier" with a strong emphasis. For the logo, it's the visual focus. And for the tagline, we centered the value proposition around it: Premier Service. Premier Locations. Premier Value. We believe this is a great way to further Premier's reputation and differentiation in the marketplace. Since most of Premier's lead generation comes from the online space, Think also utilized the knowledge of how people respond to colors online. Both green and orange are great colors for people to emotionally connect with, and produce the most "action" online. From a user experience point-of-view, Think worked with Premier to generate an entirely new site structure and supporting content that visitors would naturally look for, and want to interact with. The new site was designed exclusively for customer needs to be met as quickly and as intuitively as possible. By producing a brand identity that its employees can embody, and that resonates with its customers' mindset, Premier has entirely elevated itself above the marketplace competition. Its new website delivers a user experience that speaks to customer needs in every way, offering multiple action and interaction points, as well as the information customers look for - how they look for it. The new site offers many other prospect-friendly features to help with lead generation, and the new back-end delivers a rich CRM experience to help with lead nurturing. Feel free to check out the site live: www.pbcenters.com.